Wire free CCTV camera system with monitor This wireless camera monitoring system makes the ideal baby monitor with its high sensitivity audio and infra-red night vision. This baby monitoring system can be set up in minutes. The handy wire free camera and monitor can moved around your home with ease and requires no cabling. Because of the built in 2 way audio this system makes an ideal front and back entry phone system. CCTV camera system with monitor A great value camera monitoring system that can be set up with very little hassle and includes two-way audio features. 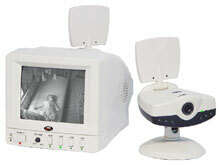 With its 2 way audio capabilities this system makes an ideal baby monitor or door video entry phone. The camera includes close range infra-red night vision making it suitable for night time and low light level applications. Create an instant camera monitoring system that connects to your main television. The camera is suitable for all types of monitoring applications and is suitable for exterior use (rated to IP44). This incredible pack comes complete with 4 monochrome CCTV cameras, and our remote controlled VS42 switching unit. 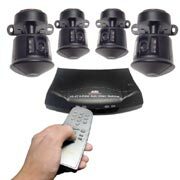 You can monitor 4 locations around your home or office from any SCART equipped television set or VCR. • Suitable for driveways, parking areas, gardens etc.